If you have a new born baby and another kid of 1-3 ages then you cannot go for a double stroller. This is a very common problem and to solve the problem this stroller review is going to help you a lot. Parents who have two children with close age difference for them Joovy Caboose Ultralight Stroller is the best choice. In this review you will get to know about the best features, pros, cons & additional information of Joovy Caboose Ultralight Stroller. The review starts with the image of this product and then the it ends with our final words for the stroller. Right now in the market, you will find four different colors of this stroller which are black, green, orange and blueberry. The best part is that you can choose any of these colors for your child whether your child is a boy or girl. The blueberry color is the most exclusive and the most popular color among all the colors. So you can go for this. However, it totally depends on you which on you want to choose. 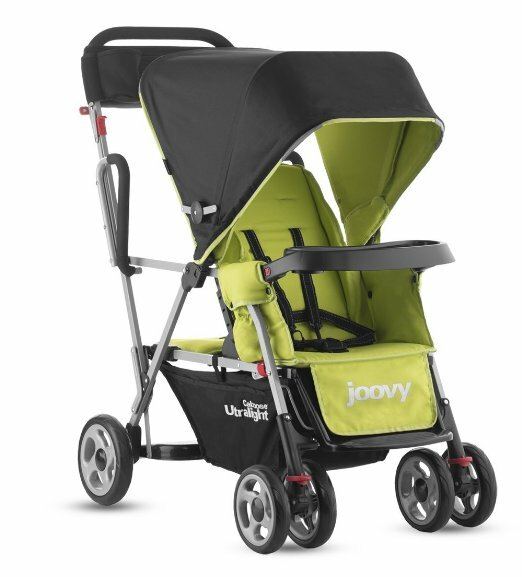 One of the best features of Joovy Caboose Ultralight Stroller is that, it is the lightest stroller of the market. From the name you can guess that the main feature of this stroller is lightweight. This is a stroller that will weight as a single stroller but will work as a popular double stroller. This stroller weights 22.1 pounds which is 20% lighter than the other Caboose strollers. 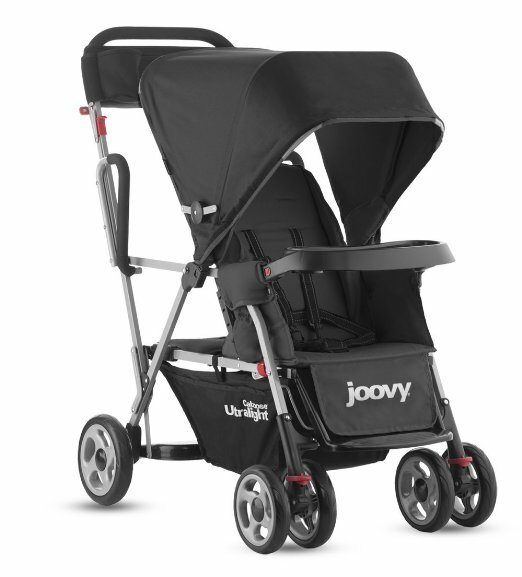 The Joovy Caboose Ultralight stroller has the new front seat decline system and this unique feature will allow your baby to have a sound sleep. While your baby is sleeping, this reclining seat covers the rear bench seat. At this time, your older boy or girl will need to stand in the rear. The 150 degrees recline seat gives you an easy handling experience. To give you extra safety, Joovy has added a rear suspension to all the four wheels. This will now moderate the ride of your baby. Moreover, it has a parking brake also. You will need to press on the pedal and both sides of the stroller will be locked. The most lightweight and maneuverable stroller. 3rd position reclining front seat with over-sized canopy. Has a big storage basket and bid side pockets. Includes universal car seat adapter. Very convenient for family trips. Removable tray which includes two cup holders. Little difficult to fold. You will require 2 hands for folding it. Not nap friendly for the older kid. The best he can do is lean against the side of the rail. When the stroller is folded it cannot stand by itself. Moreover, first you need to lock all the wheels and then lean the stroller against something. Does not have up or down wards locking and folding option. Although it has a big basket but it is hard to get to the basket while walking. All in all, this stroller is good for those parents who have two children one new born and another ½ year old. This is not the best stroller as it has many cons but in this price range you will surely get a high quality lightweight stroller .